Didemnin B is a depsipeptide derived from a Caribbean tunicate (sea squirt) that has demonstrated antineoplastic activity against a variety of murine tumor models, including the L1210 and P388 leukemia, the B16 melanoma, and M5076 sarcoma cell lines. 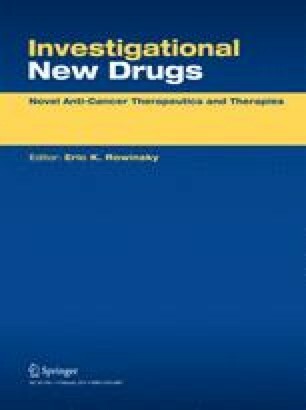 Based on these data, we designed a phase II trial in which 15 patients with measureable, unresectable colorectal cancer were treated with Didemnin B at an initial dosage of 3.47 mg/m2 over 30 minutes administered by intravenous infusion every 28 days; the dosage was altered in accordance with the toxicity observed, with only one patient requiring a dosage reduction for pronounced nausea and vomiting. No hematologie or nonhematologic toxicity developed. No complete or partial responses were observed. These results do not compare favorably with results of treatments using other single agents or combinations that are currently available for the treatment of advanced colorectal cancers. However, because of the tolerable levels of toxicity experienced by in our patients, it is possible that an insufficient dose of the medication was delivered. We concluded that Didemnin B is not active against of colorectal cancers at the dosage and schedule at which it was administered in this study.